How to draft a proper Thank You For The Phone Interview Letter letter? 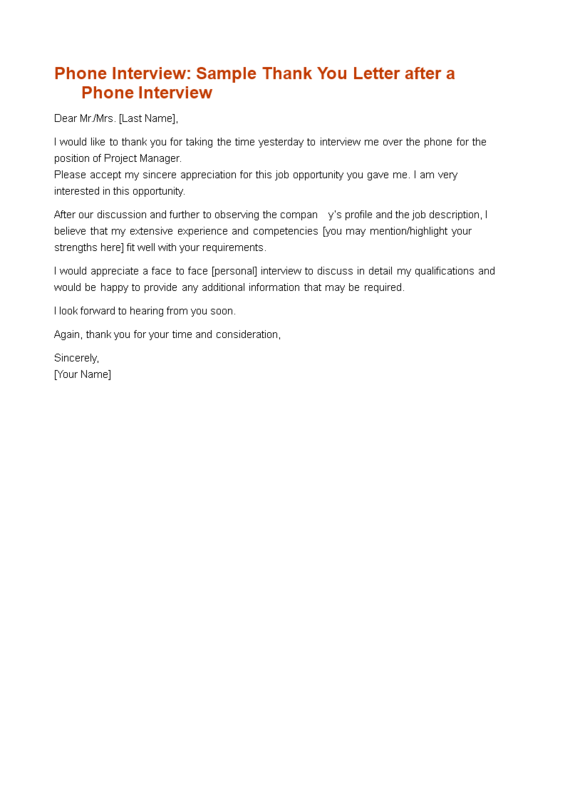 Download this professional and polite drafted Thank You For The Phone Interview Letter template now! Great service or quality deserve to be rewarded! If you want to send a proper Thank You Note to someone, we recommend you to check out this Thank You For The Phone Interview Letter. This Thank You message will capture your receiver's attention for sure! For those who are in a Management position, and who work in Finance, Admin, HR, purchasing, etc, sending a collective or individual Thank You note from time to time can work very motivating for the receivers! The right stimulation will help you to achieve mutual goals faster and will benefit your results! After downloading and filling in the blanks, you can easily customize e.g. style, typography, details, and appearance of your Thank you note. Download this professional Thank You For The Phone Interview Letter template now and Thank somebody today! Phone Interview: Sample Thank You Letter after a Phone Interview Dear Mr./Mrs. Last Name , I would like to thank you for taking the time yesterday to interview me over the phone for the position of Project Manager..